On what's on the ballot: “My name may not be on the ballot, but our progress is on the ballot. Tolerance is on the ballot. Democracy is on the ballot. Justice is on the ballot. Good schools are on the ballot. 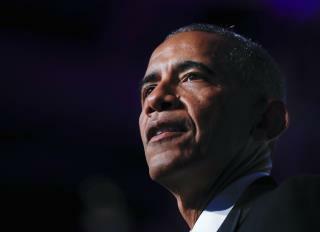 Ending mass incarceration, that’s on the ballot right now.” Sources tell Politico Obama strayed significantly from a more staid version of the speech. On Donald Trump: He's "somebody who has fought against civil rights and fought against equality and who has shown no regard for working people most of his life." On the end of the birther controversy: "I mean: (ISIS), North Korea, poverty, climate change—none of those things weighed on my mind like the validity of my birth certificate. And to think: that with just a 124 days to go, under the wire, we got that resolved." caliph obama is a "personal insult" to the usa and the world! fubo fubar! What I find most insufferable about Obama, is his arrogance. He doesn't even know the history of the civil rights movement, or the history of slavery in North America. Yet, he presumes to lecture all of us about these subjects, and about a host of other topics about which he knows little or nothing. He is a stuffed shirt, a phony, and a fraud. Its a shame that people of color are taken in by this guy. He pretends to be one of them, when it suits his political purposes, but in reality, he's a rich, ambitious, politically connected guy who just happens to have black skin.